A passenger airline is an airline dedicated to the transport of passengers. A hardpoint is a location on an airframe designed to carry an external or internal load. This includes a station on the wing or fuselage of a civilian aircraft or military aircraft where external jet engine, ordnance, countermeasures, gun pods, targeting pods or drop tanks can be mounted. A stick shaker is a mechanical device to rapidly and noisily vibrate the control yoke of an aircraft to warn the pilot of an imminent stall. A stick shaker is connected to the control column of most civil jet aircraft and large military aircraft. Slats are aerodynamic surfaces on the leading edge of the wings of fixed-wing aircraft which, when deployed, allow the wing to operate at a higher angle of attack. A higher coefficient of lift is produced as a result of angle of attack and speed, so by deploying slats an aircraft can fly at slower speeds, or take off and land in shorter distances. They are usually used while landing or performing maneuvers which take the aircraft close to the stall, but are usually retracted in normal flight to minimize drag. They decrease stall speed. The aircraft climbed to about 325 feet (99 m) above ground level while spewing a white mist trail of fuel and hydraulic fluid from the left wing. The first officer had followed the flight director and raised the nose to 14 degrees, which reduced the airspeed from 165 knots (190 mph; 306 km/h) to the takeoff safety airspeed (V2) of 153 knots (176 mph; 283 km/h), the speed at which the aircraft could safely climb after sustaining an engine failure. :53-54 However, the engine separation had severed the hydraulic fluid lines that controlled the leading edge slats on the left wing and locked them in place, causing the outboard slats (immediately left of the No. 1 engine) to retract under air load. The retraction of the slats raised the stall speed of the left wing to approximately 159 knots (183 mph; 294 km/h), 6 knots (6.9 mph; 11 km/h) higher than the prescribed takeoff safety airspeed (V2) of 153 knots (176 mph; 283 km/h). As a result, the left wing entered a full aerodynamic stall. The NTSB determined that the damage to the left wing engine pylon had occurred during an earlier engine change at the American Airlines aircraft maintenance facility in Tulsa, Oklahoma, between March 29 and 30, 1979.  :68 On those dates, the aircraft had undergone routine service, during which the engine and pylon had been removed from the wing for inspection and maintenance. The removal procedure recommended by McDonnell-Douglas called for the engine to be detached from the pylon before detaching the pylon itself from the wing. However, American Airlines, as well as Continental Airlines and United Airlines, had developed a different procedure that saved approximately 200 man-hours per aircraft and "more importantly from a safety standpoint, it would reduce the number of disconnects (of systems such as hydraulic and fuel lines, electrical cables, and wiring) from 79 to 27." :26 This new procedure involved the removal of the engine and pylon assembly as a single unit, rather than as individual components. United Airlines' implementation involved the use of an overhead crane to support the engine/pylon assembly during removal and installation. The method chosen by American and Continental's procedures supported the engine/pylon assembly with the hold of a large forklift. On June 6, 1979, two weeks after the crash, the Federal Aviation Administration suspended the type certificate for the DC-10, thereby grounding all DC-10s under its jurisdiction. 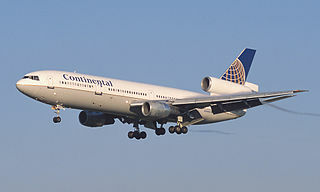 It also enacted a special air regulation banning the DC-10 from U.S. airspace, which prevented foreign DC-10s not under the jurisdiction of the FAA from flying within the country. :47 This was done while the FAA investigated whether or not the airplane's engine mounting and pylon design met relevant requirements. Once the FAA was satisfied that maintenance issues were primarily at fault and not the actual design of the aircraft, the type certificate was restored on July 13 and the special air regulation repealed. However, the type certificate was amended, stating that "...removal of the engine and pylon as a unit will immediately render the aircraft un-airworthy." 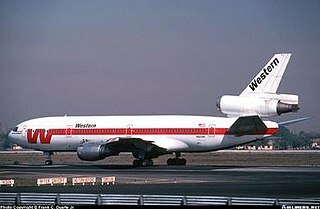 Despite initial safety concerns, DC-10 aircraft continued to serve with passenger airlines for over 30 years after the crash of Flight 191. DC-10 production ended in 1988. Many retired passenger DC-10s have since been converted to all-cargo use. DC-10 freighters, along with its derivative, the MD-11, constitute part of the FedEx Express fleet. The DC-10s have been upgraded with the glass cockpit from the MD-11, thereby turning them into MD-10s. American Airlines retired its last DC-10s in 2000 after 29 years of service. In February 2014, Biman Bangladesh Airlines operated the final DC-10 passenger flights. DC-10s continue to be used extensively in air freight operations, and military variants also remain in service. For 32 years there was no permanent memorial to the victims. Funding was obtained for a memorial in 2009, through a two-year effort by the sixth-grade class of Decatur Classical School in Chicago. The memorial, a 2-foot-high (0.6 m) concave wall with interlocking bricks displaying the names of the crash victims, was formally dedicated in a ceremony on October 15, 2011. The memorial is located at Lake Park at the northwest corner of Lee and Touhy Avenues,  two miles east of the crash site. Chicago folk singer Steve Goodman wrote the song "Ballad of Flight 191 (They Know Everything About It)" in response to the crash and the subsequent investigation as the inaugural song for a series of topical songs which aired on National Public Radio in 1979. The Michael Crichton novel Airframe described the incident in detail as an example to the reader how a "good airplane (DC-10)" could be "destroyed by bad press". Delta Air Lines Flight 1141 was a scheduled domestic passenger flight between Dallas/Fort Worth, Texas and Salt Lake City, Utah. 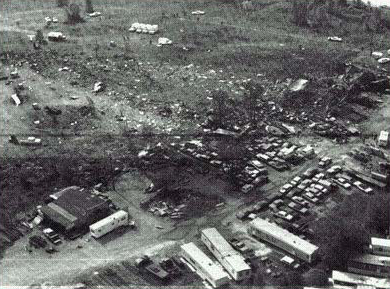 On August 31, 1988, the flight, utilizing a Boeing 727-200 series aircraft, crashed during takeoff, killing 14 of the 108 people on board and injuring 76 others. 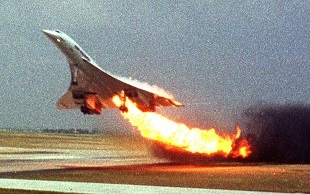 Air France Flight 4590 was an international charter flight from Paris to New York City flown by an Aérospatiale-BAC Concorde. On 25 July 2000 at 16:43 Central European Time, the aircraft serving the flight ran over debris on the runway during takeoff, blowing a tyre and puncturing a fuel tank. The subsequent fire and engine failure caused the aircraft to crash into a hotel in nearby Gonesse two minutes after takeoff, killing all 109 people aboard and four people in the hotel, with another person in the hotel critically injured. China Airlines Flight 358 was a Boeing 747-2R7F freighter plane that crashed on December 29, 1991 shortly after takeoff from Chiang Kai-shek International Airport in Taipei, Taiwan. Continental Airlines Flight 1713 was a commercial airline flight that crashed while taking off in a snowstorm from Stapleton International Airport in Denver, Colorado on November 15, 1987. The Douglas DC-9 was operated by Continental Airlines and was a scheduled flight to Boise, Idaho. Twenty-five passengers and three crew members died in the crash. The McDonnell Douglas DC-9 is a twin-engine, single-aisle jet airliner. It first flew and entered airline service in 1965. The DC-9 was designed for frequent, short flights. The final DC-9 was delivered in October 1982. United Airlines Flight 266 was a scheduled flight from Los Angeles International Airport, California, to General Mitchell International Airport, Milwaukee, Wisconsin via Stapleton International Airport, Denver, Colorado with 38 on board. On January 18, 1969 at approximately 18:21 PST it crashed into Santa Monica Bay, Pacific Ocean, about 11.5 miles west of Los Angeles International Airport, four minutes after takeoff. Trans World Airlines (TWA) Flight 159 was a regularly scheduled passenger flight from New York City to Los Angeles, California, with a stopover in Cincinnati/Northern Kentucky International Airport, Kentucky, that crashed after an aborted takeoff from Cincinnati on 6 November 1967. The Boeing 707 attempted to abort takeoff when the copilot became concerned that the aircraft had collided with a disabled DC-9 on the runway. The aircraft overran the runway, struck an embankment and caught fire. One passenger died as a result of the accident. Continental Express Flight 2574 was a scheduled domestic passenger airline flight operated by Britt Airways from Laredo International Airport in Laredo, Texas, to Houston Intercontinental Airport (IAH) in Houston, Texas. On September 11, 1991, the Embraer EMB 120 Brasilia, registered N33701, crashed while the turboprop aircraft was en route to Houston, killing all 14 people on board. The aircraft wreckage hit an area near Eagle Lake, Texas which is located approximately 65 miles (105 km) west-southwest of IAH. A turbine engine failure occurs when a turbine engine in an aircraft unexpectedly stops producing thrust or power production due to a malfunction other than fuel exhaustion, although the term "turbine engine failure" can also apply to failure of any turbine engine, such as ground-based turbines used in power plants, turbine-engined vessels and vehicles, etc. Several aviation incidents and accidents have occurred in which the control surfaces of the aircraft became disabled, often due to failure of hydraulic systems or the flight control system. Other incidents have occurred where controls were not functioning correctly prior to take-off, either due to maintenance or pilot error, and controls can become inoperative from extreme weather conditions. Aircraft are not designed to be flown in such circumstances, however a small number of pilots have had some success in flying and landing aircraft with disabled controls. United Airlines Flight 2885 was a scheduled cargo flight from Cleveland to Los Angeles, with stopover in Detroit. On January 11, 1983, a DC-8 operating Flight 2885 crashed after take-off from Detroit, killing all 3 crew. The National Transportation Safety Board (NTSB) investigation determined that the cause for the crash was pilot error. On 30 October 2014, a Beechcraft King Air B200 twin turboprop crashed into a building hosting a FlightSafety International (FSI) training center shortly after taking off from Wichita Mid-Continent Airport in Wichita, Kansas. The pilot, the only person on board, was killed together with three people in the building; six more people in the building were injured. JAL Cargo Flight 8054 was a charter flight on January 13, 1977, from Grant County, Washington to Tokyo with a stopover in Anchorage. The flight crashed during the initial climb phase, shortly after takeoff from Anchorage due to pilot intoxication. Emery Worldwide Flight 17 was a regularly scheduled domestic cargo flight, flying from Reno to Dayton with an intermediate stopover at Rancho Cordova. On February 16, 2000, the DC-8 crashed onto a salvage yard shortly after taking off from Sacramento Mather Airport, killing all three crew members on board. An investigation by the National Transportation Safety Board (NTSB) revealed that during the aircraft's rotation, a control rod to the right elevator control tab detached, causing a loss of pitch control. The crew attempted unsuccessfully to return to Mather airport. 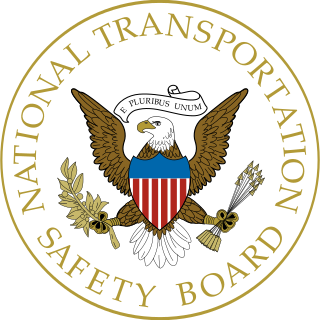 The NTSB further found that an incorrect maintenance procedure, which was implemented by Emery Worldwide, introduced an incorrect torque-loading on the bolts which were supposed to connect the control rod. Trans International Airlines Flight 863 was a ferry flight from John F. Kennedy International Airport in New York City to Washington Dulles International Airport. On September 8, 1970, the Douglas DC-8 crashed during take-off from JFK's runway 13R. None of the 11 occupants, who were all crew members, survived. 1 2 3 4 5 6 7 8 9 10 11 12 13 14 15 16 17 18 19 20 21 22 23 24 "Aircraft Accident Report: American Airlines, Inc. DC-10-10, N110AA, Chicago O'Hare International Airport, Chicago, Illinois, May 25, 1979" (PDF). National Transportation Safety Board. December 21, 1979. NTSB-AAR-79-17. Retrieved September 6, 2016. 1 2 3 Vatz, Mara E. (2004). Knowing When to Stop: The Investigation of Flight 191 (Masters thesis). Cambridge, MA: Massachusetts Institute of Technology, Dept. of Humanities, Program in Writing and Humanistic Studies. p. 9. OCLC 59008054 . Retrieved May 2, 2015. ↑ Special to the New York Times (May 27, 1979). "Dive May Have Been Televised". The New York Times (Vol. 128, No. 44, 230). NYTimes Co. Associated Press. Retrieved March 21, 2018. ↑ Young, David (June 3, 1979). "'...191, do you want to come back?'". Chicago Tribune (Issue: 132nd Year, No. 154). p. 16, Section 1. Retrieved May 27, 2017. ↑ Macarthur, Job (1996). Air Disaster (2 ed.). Shrewsbury: Airlife. p. 49. ISBN 9781875671199. OCLC 464170955. ↑ "Accident Photo: American 191". AirDisaster.Com. Archived from the original on June 7, 2011. Retrieved April 16, 2011. ↑ "Tuskegee Airman Heads Chicago Air Crash Probe". JET . 56 (13): 5. June 14, 1979. Retrieved April 16, 2011. ↑ "Abandoned & Little-Known Airfields: Illinois, Northern Chicago area". Abandoned & Little-Known Airfields . Retrieved April 15, 2011. 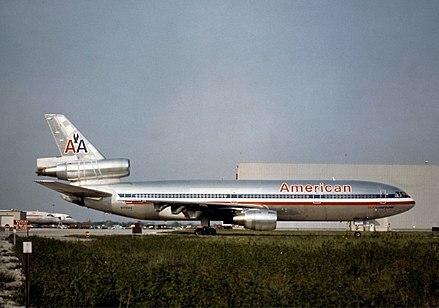 1 2 3 "Chicago DC‐10 Accident Findings". Aircraft Engineering and Aerospace Technology. 52 (3): 19–20. 1 March 1980. doi:10.1108/eb035612. ISSN 0002-2667. 1 2 3 Barnett, Arnold; Lofaso, Anthony J. (November 1, 1983). "After the Crash: The Passenger Response to the DC-10 Disaster". Management Science. 29 (11): 1225–1236. doi:10.1287/mnsc.29.11.1225. ISSN 0025-1909. 1 2 3 Thornton, Paul (January 7, 2007). "A final flight into the history books". LA Times. Retrieved April 15, 2011. 1 2 Mankiewicz, R.H (1981). "Statut et interprétation des dispositions de la Convention de Chicago en droit américain dans l'affaire des DC 10". Annuaire français de droit international (in French). 27 (1): 499–504. doi:10.3406/afdi.1981.2458. ↑ "ASN Aircraft accident McDonnell Douglas DC-10-10 N110AA". AviationSafety.net. May 11, 2007. Retrieved July 27, 2009. ↑ Ranter, Harro. "ASN Aircraft accident McDonnell Douglas DC-10-10 N903WA Mexico City-Juarez International Airport (MEX)" . Retrieved February 6, 2017. ↑ "Runway Confusion Tied to Jet Crash". The Pittsburgh Press. UPI. November 1, 1979. ↑ "Aircraft Accident: DC. 10 ZK-NZP Flight 901". New Zealand Disasters. Christchurch City Libraries. Archived from the original on July 8, 2011. Retrieved July 13, 2011. ↑ "McDonnell Douglas' DC-10 makes its last passenger flight today". The Verge. Retrieved December 6, 2013. ↑ "Federal Express Fleet". Airfleets.net. Retrieved April 16, 2011. ↑ "MD-10 Program". Boeing. Archived from the original on May 10, 2011. Retrieved April 16, 2011. ↑ Special To The New York Times (May 27, 1979). "American Airlines' List of Passengers Killed in Jet Crash at Chicago". The New York Times. NYTimes Co. p. 20. Archived from the original on September 9, 2017. ↑ "Investigation: American Airlines 191". AirDisaster.com. Archived from the original on August 13, 2006. Retrieved July 26, 2006. ↑ "Family's air tragedy repeats itself". The Milwaukee Sentinel. The Associated Press. May 29, 1979. Retrieved January 16, 2016. ↑ "Finally, a memorial for American Flight 191 that we've missed out for the last 3 decades. victims". Daily Herald. Retrieved August 6, 2011. ↑ Delgado, Jennifer. "Memorial to victims of 1979 plane crash unveiled". Chicago Tribune. Retrieved October 15, 2011. ↑ "Flight 191 Memorial - Des Plaines Park District". dpparks.org. Retrieved April 1, 2018. ↑ The Crash of Flight 191 (DVD). The History Channel. Archived from the original on October 31, 2007. ↑ "Chicago Plane Crash / Flight Engine Down". Seconds From Disaster . National Geographic Channel. ↑ "Air Disasters". Smithsonian Channel. Archived from the original on March 5, 2016. Retrieved January 16, 2016. ↑ Eals, Clay (2007). Steve Goodman: Facing the Music. Toronto: ECW. pp. 558–9. ISBN 978-1-55022-732-1. Wikimedia Commons has media related to American Airlines Flight 191 .